Most of the settlements in Santorini are built along the volcanic cliffs of Caldera to face the breathtaking view of the vast Aegean Sea and the imposing volcano standing right in the middle of the water. The whole of Santorini offers thrilling views, but there are some special places from where visitors are left stunned and speechless by the unique images created depending on the time of the day and the playful tricks of the sun. Oia - Perched on the cliffs of red-rock Caldera, Oia is one of Santorini’s traditional settlements, which apart from the typical Cycladic architecture, visitors can also admire unrivaled sunset views! While the sun is slowly diving into the sea, the whole of the sky turns into a painter’s palette including every warm shade of purple, orange and red!...A very romantic scenery, chosen by lovebirds around the globe to exchange or renew their vows! Fira – The main town of Santorini is a place drenched by the bright Greek sun, offering magnificent panoramic views over the deep blue Aegean Sea, the volcano and the small volcanic islets of Nea and Palea Kameni. The morning views of the sparkling sea water will surely make your day start in happiness! Imerovigli – Amphitheatrically built, Imerovigli is considered to be Santorini’s most privileged balcony! Offering views to the half-circle shaped cliffs of Skaros and all over Caldera, as well as the Aegean Sea. Day or night the view from Imerovigli is magical. Face the unobstructed views to Santorini’s horizon and relax your eyes with the natural colors of this unique Aegean island! 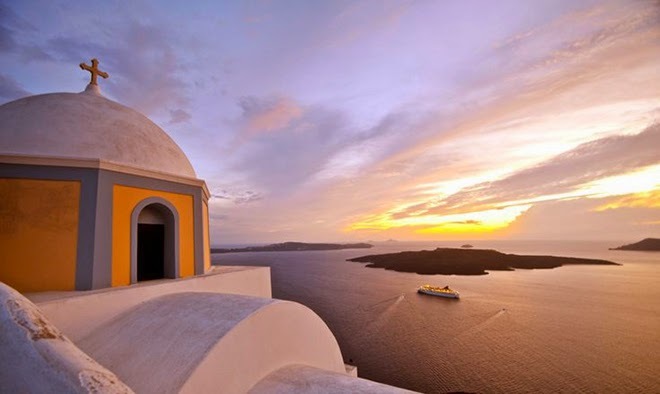 Visit Santorini and feast your eyes on the most magnificent views!